I wanted to be a veterinarian when I grew up. That's what I remember of my career goals before type 1 diabetes - if you could call them that, I was only 5 after all. We got to dress up one day at school and I remember wearing one of my dad's white work shirts with a stethoscope (a real one, as my aunt was in nursing school) around my neck and a box of my stuffed animals in my arms. This loose idea vaguely represented the thing I most wanted to "be" someday; I loved my cat Tiger and when we got Sparky (a.k.a. 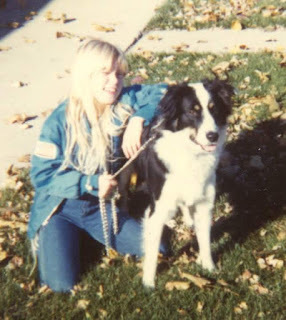 the Best Dog Ever) a couple of years later my heart was set firmly on my chosen profession. Diabetes came along then, in the winter of my 12th year. My parents were told by a well-meaning resident at the children's hospital that I shouldn't worry about concepts like career or retirement, since I probably wouldn't live much past 40. Fortunately the endocrinologist on call didn't share such a dim view of my future. It was 1983 and things were changing, he told my parents. If I took care of myself, he said, I'd be just fine. Fortunately I outlived him and the grim limit placed on me 34 years ago. But adulthood proved challenging the minute I went to college. I was lucky to still be covered on my parents' health insurance since I was a full-time student. But to be a veterinarian meant I couldn't work more than a few hours on campus here and there, so I tried to get experience with a few internships. The end of my college years loomed before me and with it, the prospect of having no health insurance. I had to choose. Find a respectable job with insurance and give up on veterinary school, or take a chance on having no insurance while doing graduate studies (the student union offering wasn't that great, and I'd be paying out of pocket for virtually all my diabetes supplies). I would have to leave my city for grad school so I'd need to work to pay rent, but I wouldn't have enough money to buy test strips or insulin unless my parents helped out. They'd already put me halfway through college so it didn't seem fair to ask for more. So I chose. I was still lucky; my first jobs had health insurance coverage. In those days there was always a 90-day waiting period so I stocked up like a prepper on supplies. But it wasn't all golden. At one job the insurance carrier threatened to drop me for having diabetes. They eventually backed down, but still denied coverage for more than two bottles of insulin a month. My old doctor heroically championed on my behalf more than once, telling them she would decide how much I needed, not them. Only four test strips per day were covered no matter what (this was in the mid-1990s), so I used the generic drug store meter even though it was less accurate. I never really investigated getting an insulin pump; it seemed hopeless, given the way insurers already treated someone like me. And when I took a job that didn't offer health insurance at all, I amassed a collection of denial letters from Blue Cross, Aetna, Humana and others - because I was "presumed uninsurable" due to type 1 diabetes. My A1Cs, despite all the challenges, were in the 5.9 - 6.2% range, stellar at the time, and I was otherwise completely healthy. But no matter. My luck still held for a while thanks to living in my home state of Illinois. The Children's Health Insurance Plan, or CHIP, had a high risk pool for people like me - those with 'catastrophic' illnesses like AIDS, cancer, juvenile diabetes and cystic fibrosis - who would never find coverage on their own without a job that offered it. I was grateful the day I received my enrollment card. That feeling quickly turned to shock when I saw my proposed monthly premium: $475.00. For nothing but the coverage itself. My deductible was $5,000.00, which in the late 1990s was amazingly high (and still is for an individual). I had insurance, sure, but it would be October or November of the following year before I actually didn't have to pay for everything. I was doing something I loved, and that I was good at, but following my passion meant paying the price, literally, for my health. For a while I tried to make it work. But it was becoming obvious I'd have to find a job with insurance, regardless of what I actually wanted to do with my life. There are ways not to work for a living. There was a time when women weren't expected to have a career. I could have filed for unemployment and neglected my health to the point I would qualify for disability coverage. (I know a few 'healthy' people who did just that, unethical as it was.) But I wanted to work and liked having my own little career. I enjoyed having the money to pay my own way, to get along in life without depending on someone. And I liked being a productive member of society. I tutored English for a few years to help people like me to develop job skills. I volunteered at the hospital where I was diagnosed, in part to show kids it was possible to live a 'normal' life with type 1 diabetes. When we moved to Florida and Texas for my husband's job, I went stir crazy for a few weeks until I landed some type of employment. If my body can handle it, I want to keep working as long as I can. I want to contribute, even if I have to compromise by working in a job that might not be the best fit for me. And it doesn't bother me to pay taxes. I write my property tax check every year for schools even though I don't have children, and I pay the IRS every paycheck to fund a government even though I vehemently disagree with its current leadership, because I'm American and this is how our society functions. But I can't for the life of me figure out why the Affordable Care Act and the protections it offers for people like me are suddenly being yanked away. When the ACA was passed in 2014, I felt safe for the first time. I no longer had to worry about caps, coverage denials and higer costs for no given reason. I could ignore all the negative stigma that so many still have about diabetes. (That I somehow caused my own disease, even though type 1 is an autoimmune disorder with no obvious trigger. That I'm a burden with my higher health care costs, even though insulin and test strip manufacturers make record profits off their products. That I'm less worthy somehow, because my body decided to stop making insulin 34 years ago.) How sad and shameful and un-American these thoughts are. Now we go back in time to dark days of worry and panic, of feeling like a ship without life boats. It's almost as if the people in charge want me to fail, just so they can survive.